I love the dependency graph display. 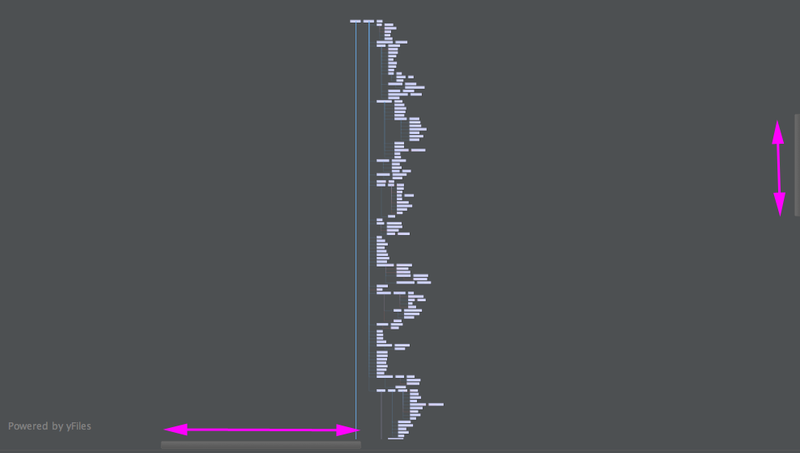 But on projects with long lists of dependencies (where I need it the most), the size of the canvas that the graph is drawn on is many times bigger than the graph. This makes it hard to keep on the screen when scrolling with the mouse, especially horizontally. My screenshot shows a typical example, zoomed into 1:1. The displayed portion of the graph is an example of how wide the graph is. You can see that the horizontal scrollbar (emphasized with a magenta arrow) at the bottom shows that we can scroll for dozens of screens to either side. Those screens are all blank, of course, top to bottom. 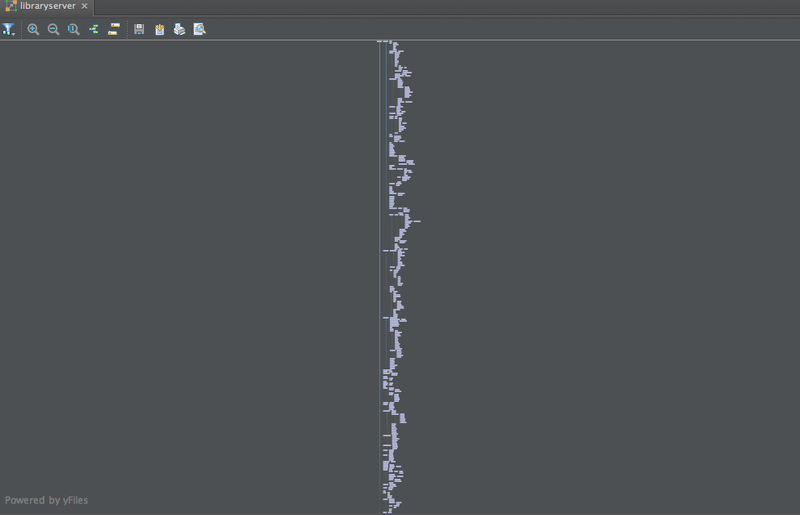 The vertical scrollbar is also not quite proportional. If I scroll it to the top, the graph starts after about 5 or 6 screen lengths of scrolling down. If I scroll to the bottom, the graph is dozens up screens of scrolling upwards. At this scale, the entire canvas is shown and no scrollbars show. If I zoom in a little, you can see that the scrollable area is much larger than the graph, as the scrollbar thumbs (magenta highlights added) show. It would be much easier to keep the graph on screen, when zoomed into 1:1, if the horizontal and vertical scrolling were limited to the area of canvas which has the graph on it. Is there some way I can use this that will let me easily scroll around, for instance between dependencies showing conflicts (which are often many screens apart) without getting lost in the huge amount of blank space around the graph? Can this blank space be eliminated? 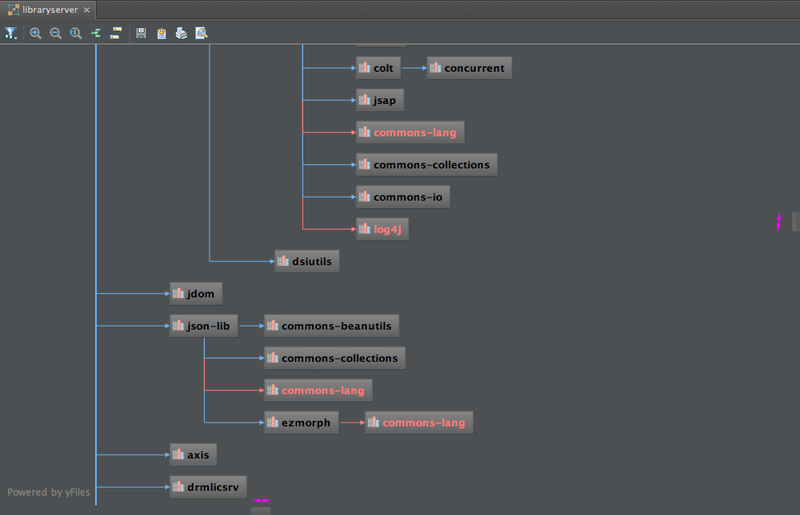 I am using Intellij IDEA IU-123.150, on MacOSX 10.8.2 JVM 1.6.0_37 (Apple), using the Darcula look and feel. But this behavior has existed, at least on all my development machines, since the introduction of the graph feature in version 10.